For these guys to be very cool you must trim the beard at the hairdresser. Feel the guys in the hairdresser's armchair to make a nice change of style. They want to impress their girls with a good haircut and a striking beard that no one can resist. You may like to wear a mustache, beard or goatee. 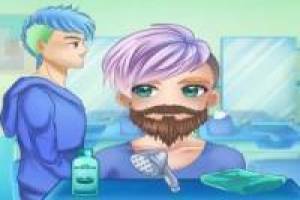 Enjoy the game Cool Boys, it's free, it's one of our hairdressers games we've selected.